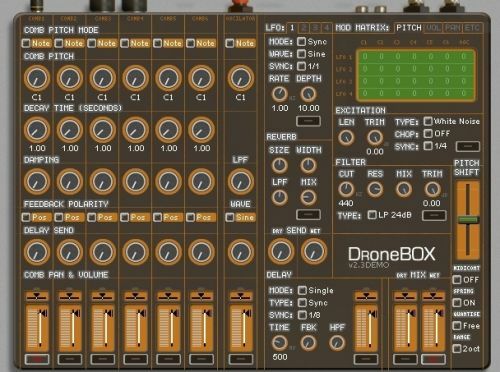 Dronebox is a bank of six resonant, tunable comb filters with extensive modulation options. It can be used to create lush evolving drones or to add resonance to source material. For instance it can simulate the sound of the sympathetic strings of the sitar – great for processing guitar. Polycomb is a polyponic comb filter VST effect. It is similar to Dronebox but the comb filters are controled by polyphonic midi input. This allows rapid chord changes with up to 32 note polyphony. A unique synthesis and effect plugin based on the Shepard Tone auditory illusion. It generates mind bending infinite scales, psychedelic drones and fascinating sonic textures. It works as a tone generator, a ring modulator, phaser, flanger or resonant filter bank effect.